We reluctantly left New Zealand last week for the hop over to Sydney. In what was beginning to seem like more than just coincidence, I was denied entry into the country for the second straight time. On the way from Hong Kong to NZ I had visa issues (they had no record of my e-visa). This time the culprit was some rogue New Zealand turf still stuck to the bottom of my hiking boots. Like a victim of the decon team in Monsters Inc., I found myself surrounded and quickly relieved of my shoes leaving me standing sock less as the offending boots were whisked away with hazmat tongs. Ten minutes later, and owner of the cleanest boots in Oz, I was finally allowed to enter Australia. The overriding theme of our stay in Sydney revolved around sports....we figured we might as well jump into Aussie culture with both feet. Brian will put up a post covering our experiences there. However the secondary theme of our stay was pretty darn typical of New South Wales as well: enjoying the waterfront/coast/beaches and all they have to offer. Pretty much all of our sightseeing was along the water, whether it was gazing hypnotized at the Opera House, checking out the Harbor bridge and Luna Park, riding the ferries and enjoying the views between all the various harbor stops, walking the gorgeous four mile coast path between Coogee and Bondi beaches, watching the surfers out at Manly beach, or catching a boat over to the area's best fish and chips place in Watsons Bay for lunch. It's just a beautiful area, especially once the rains cleared and we had crisp (cold!) and sunny days. It's easy to understand how folks here have a healthier and laid-back attitude towards work and life. We were continually surprised by the number of people we saw out surfing, body boarding, kayaking, swimming, running, biking etc. at all times of the day and all days of the week. Then again, if I had those resources in my back yard I might be finding ways to make use of them as well. Despite all the natural beauty, the highlight for both of us was a man-made object. The Sydney Opera House was simply stunning. I honestly had a "pinch me, I'm actually in Australia" moment each time we would see it. It just doesn't get old, no matter how many times you see it; the people who live here told us the same thing. One of the most fascinating things about it was how it would change as the light, weather, or angle you were looking at it from changed. We did take a tour of the building as well. It was funny to contrast it with the interior of the the Budapest Opera House, built a century earlier. The latter was all chandeliers, marble and fine plush carpets while this building featured bare concrete and granite, glass and natural woods. After his multiple visits in the past couple years to Copenhagen Brian was immediately able to identify the Danish aesthetic at work. (The Opera House's architect and visionary, Jorn Utzon, is indeed Danish). We even were lucky enough to hear the Sydney Symphony play the last few minutes of the 1812 Overture, allowing us to gain a full appreciation of the outstanding acoustics of the house. The other highlight of the stay in Sydney was getting the chance to spend time with Chris and Sara Green and their three kids. Chris was Brian's roommate in grad school and it was a great opportunity for them to catch up and for us to meet the rest of his family. Sara spoiled us with some wonderful home cooked meals and Chris provided some much needed tutoring for me in the minutia of Australia's three main football codes: Australian Rules Football, Rugby League and Rugby Union. (On this trip we have now watched six different football codes: with the addition of Gaelic Football, Soccer/Football, and American Football. Here's to a global education!). We really enjoyed their company and look forward to seeing them again on our return visit to Sydney in August. 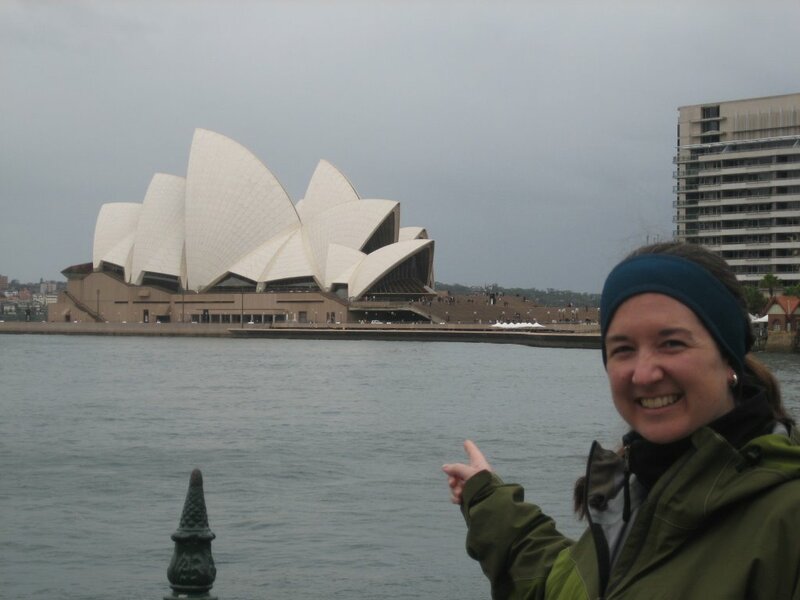 There are still a number of Sydney activities we want to do (including a performance at the Opera House and checking out a couple of the museums), but that will have to wait until we come back here at the end of our Australian adventure. For now it's on to Melbourne, Brian's Australian home. Yummy, did you go to Watson's!!!! What sort of karma is it that follows you around, Becca? You have had some interesting encounters. I'm glad that you are going to be able to attend a performance at the Opera House when you return to Sydney. Enjoy yourselves and let us see it through your eyes.